A very large part of mathematics involves taking a mathematical structure that we’re familiar with and generalizing it to some “larger” structure (for more on this, see this note on abstract thought). When we make such a generalization, our original structure becomes a special case of this new, larger structure. Accordingly, we want to make sure that we “recover” our original object when we consider the corresponding special case. It is quite often the case that generalizing our mathematical structures in this way leads to new and deeper insight into the original structures themselves, as we then have a better idea of what’s “really” going on within the structure. If all of this doesn’t make too much sense right now, don’t worry, this whole lesson is devoted to an example of this. But let me continue philosophizing for a bit. Why do mathematicians want to generalize a structure when it’s already familiar? There are several answers to this question. The most down and dirty “pure mathematician” way of answering it is to simply say “because we can”, and there’d be no harm in that. While it is definitely the case that “we can”, and that for some mathematicians this is sufficient motivation, I’d argue that even these “purest” of mathematicians see a larger goal in making such generalizations. One very important motivation for generalizing structures is that the more general object might be easier to work with, and/or easier to prove things about. For example, suppose we want to prove some statement, call it P, about some mathematical structure that we’ll call A. I.e., we want to prove that for A, P is true. Further suppose that we’re thoroughly stumped. But suppose that we could generalize A to some “larger” structure, call it B. Then we know that anything that we can prove about B will be proved about A, because A is simply a special case of B. Now if we suppose that we could easily prove that for B, P is true, then we’ll know that P is also true for A, thus showing that the generalization of A to B was fruitful. Given this set-theoretic framework, let us now ask the question: what are we really doing when we’re doing high school algebra? Surely our framework of sets and functions would be less than useful, and surely not so many people would be studying it, if we couldn’t even “recover” what we did in high school. 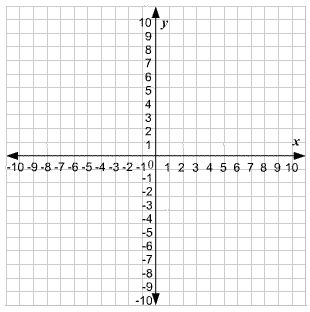 In particular, let me bring back what may or may not be a relatively painful memory from high school mathematics: graphing lines on a plane! Chances are many readers have at least the vaguest memories of the following. Now, whether or not you remember this, and whether or not you hated it/loved it/excelled at it/failed at it, doesn’t matter here. The question I’m going to answer, and that which may have helped you at the time (if help was indeed needed), is the following: What the hell are we really even doing here? What is “the plane”? What is this line? Where does it come from? Now, this question might seem so basic that it’s hardly even worth asking. It’s clear that the plane “is” the thing in figure 1. That’s what it is. End of discussion. And a line on the plane is just what’s shown in figure 2. Boom. Right there. not at all mathematical. No math proof has ever been completed via looking at or drawing pictures, and no mathematical statement or structure has been expressed solely as a picture. In math, pictures don’t “exist” in any fundamental way—only mathematical structures and logic exist. Thus, it seems less than kosher to say that some mathematical structure “is” a picture, or “exists” on a picture. Without pictures though, this question of what the hell we’re doing when we’re plotting these lines becomes a bit trickier. Luckily for us, we already have all of the necessary tools to be able to answer this question pretty thoroughly. Figure 2: Again, there it is, it’s right there. where the “…” simply means that these numbers can go on forever with no rhyme or reason, if we so desire. We note that these include the more standard numbers like “5”, where we simply write 5.0000…, with 0’s repeated forever. We also get all the fractions too, but this will just have to be taken on faith. Most importantly, there are way more numbers here than just the fractions and whole numbers—this set was indeed our first example of a “new infinity”. This set is referred to as “the continuum”, because it forms a completely “continuous” set of numbers, allowing us to move from one number to the next “continuously”. It appears I can’t give too precise of a definition of these terms, but hopefully the concept is clear. Given this “continuous” property of (which I promise is the only thing that you’ll have to take on faith this lesson), we can relatively convincingly draw this set as a line. This line goes infinitely far in both directions and has no holes (hence, continuous). This line is simply our graphical representation of the set . The set exists whether or not we draw the line—the line just helps our visually-reliant brains to “see” what this set “looks like”. Scare quotes because a set never “looks like” anything, it’s just a set! Now we get to use what we’ve created. In lesson 17 we studied the Cartesian product of two sets, which was essentially just the set of “pairs of elements”, one from each set. We also saw that we could take the Cartesian product of a set with itself, thus forming the set of “pairs of elements in a set”. Well, let us therefore construct the Cartesian product of with itself: . We then have a set of pairs of elements, where each individual element in the pair is any element in . Namely, . Now we notice that there’s a pretty nice way that we can graphically represent this set. In particular, we can take two of those lines that we supposedly drew in the previous paragraph (one line for each “copy” of in the Cartesian product), tilt one 90 degrees relative to the other one, and then we put one on top of the other. 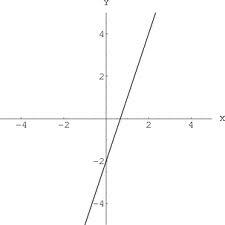 Now, if we simply label some of the points on these lines, we’d have something that looks exactly like figure 1! Thus figure 1 is our graphical representation of the set . It doesn’t “exist” by itself, but rather just reminds us that we’re talking about . This is what the plane “really is”, and we can’t go any deeper. In words, this means the set of pairs such that the “second slot” is 1 more than “6 times the first slot” (I use quotes to remind us of the order of things: we multiply by 6 first, then add 1). Thus, our subset only considers those very special points in where the second slot has this very special relationship to the first one. Accordingly, is not in this subset, because 3 is not 1 more than “6 times 2”, whereas is in this subset because 7 is 1 more than “6 times 1” (okay, I’ll stop using quotes now and you’ll just have to remember the order). Now let us make yet another arbitrary choice and let the line going horizontally in our graphical representation (figure 1) correspond to the “first slot” of the elements in , and let the vertical line correspond to the “second slot”. Now we can graphically represent our special subset by marking each point in this plane that has this very special property: that the second slot is 1 more than 6 times the first slot. When we make these infinitely many marks, we find that it forms a straight line on the plane! Thus, what we’re “really” doing when answering the question “plot on the plane” is graphically representing the particular subset of defined by this equation, in the way we’ve described above. Note that I keep writing “graphically represent” in bold because I want to emphasize that what “really” exists is the set , and we’re simply representing this set by drawing this line. Thus, we now know what we’re representing when we draw these lines, and it’s nothing but sets! I’d like to point out that there are other perspectives from which we can view this situation. One common way is to view all of this as the study of certain functions from to , and our drawings are just representations of these functions by showing the entire domain and codomain of the function simultaneously, and drawing a mark on the points corresponding to each other via this function. I could have easily written this lesson from this perspective, but I think the way we’ve done things here is tidier. It is necessary to note that there are always several different perspectives to view a mathematical structure (just as there are several angles from which one can look upon a real world structure), and that we’ve simply chosen one. Prior to this, though, it is likely that there was no perspective at all, and that we were just drawing these stupid lines all over the page with no idea of what we were “really” doing (I can’t speak for everyone, but this was certainly my view at the time). Hopefully this gives a little more perspective. As we’ll see throughout these lessons, all of the math that we’ve come to know and (possibly not) love throughout middle and high school can, and often should, be rephrased in these more abstract terms, as we now know precisely what’s really going on! I’ll skip on exercises here, as you’ve likely already spent way too much time plotting lines on a plane in your lifetime. All I ask is that you take a moment to let this significant shift in perspective and this added meaning—to something that previously seemed so lacking in meaning—really sink in!